I watched the comments come in for last week’s Rate the Dress. When I thought back to them this week, I thought the final total must be pretty dismal: I had such a strong memory of dislike. But when I looked back over them, and tallied the total, I realised that most people actually liked-to-loved the dress. There were just a couple of people who really did not like it, and their reaction was so strong that it really coloured my memory of the comments. Like I said, mostly like-to-love! Because it’s been such a busy week, my Rate the Dress pick isn’t particularly inventive. 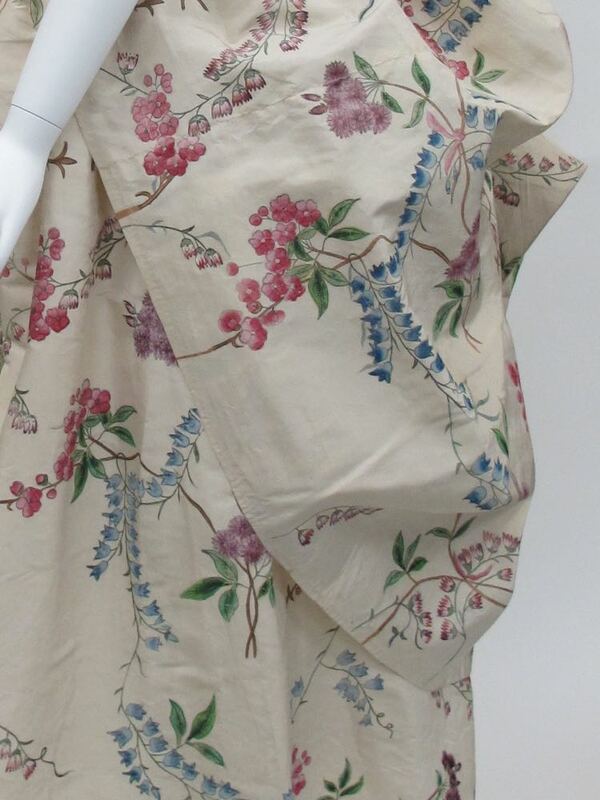 Just a classic 18th century Robe à la Anglaise in a floral fabric in a range of pretty pastel shades (or not pretty – you get to be the judge of that!). An Anglaise is an 18th century dress style with a fitted back bodice, with the central upper back pieces cut in one with the centre back skirt, with no waist seam. This Anglaise features picked-up or bustled skirts, which used to be referred to as Polonaise in the historical costuming world, and still is in many museums, including the Met. Historical costume researchers have since determined that ‘Polonaise’ referred to a specific cut of bodice – not the bustling of the skirt. So this is not really a Robe a la Polonaise, but I’ve left the Met’s title as-is. This makes total sense: almost any dress could have its overskirts picked up and bustled: why change the entire name of a gown when you do this? 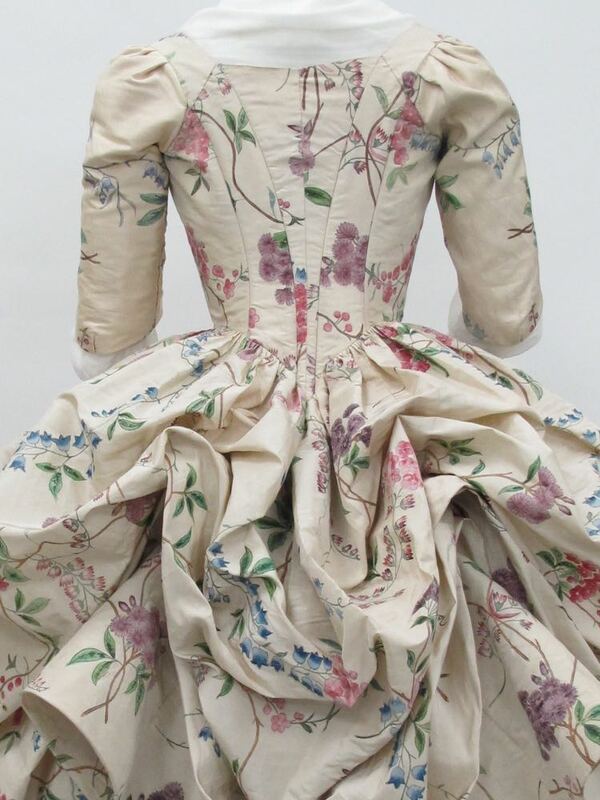 The fabric of the dress appears to be a hand-painted silk, probably from China. 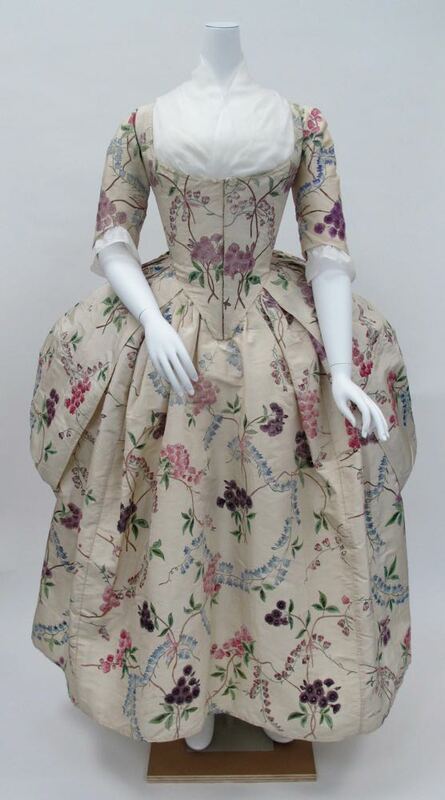 The mis-matching on the seams indicated that the fabric was pre-painted, and not intended for this specific dress style. It’s also possibly that the dress was re-made from a gown of a few decades earlier. Depending on how you look at it, this 18th century pick is either Rate the Dress in its purest (a dress only, almost totally devoid of styling and accessories, and thus completely without distraction), or least pure (a dress only, almost totally devoid of styling and accessories, and thus furthest removed from how it would have been worn in period) form. 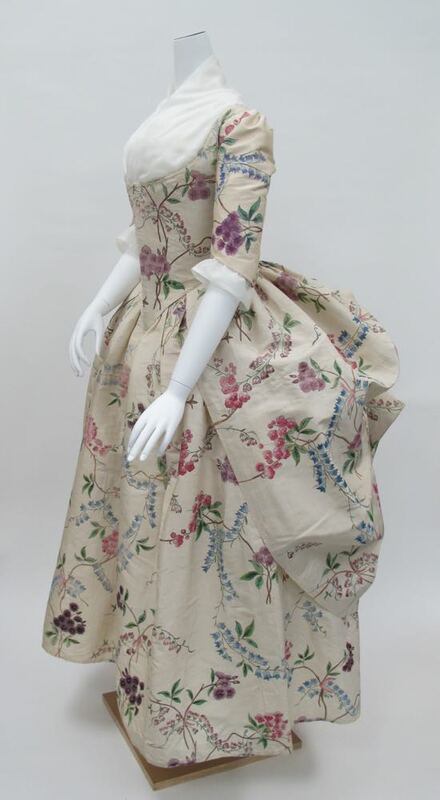 Everything I like in one dress – standout fabric, beautiful colour scheme of summery flowers and a clean 18th century silhouette! Interesting comments about the cut of the bodice, and not the shape of the skirt. Truly lovely. 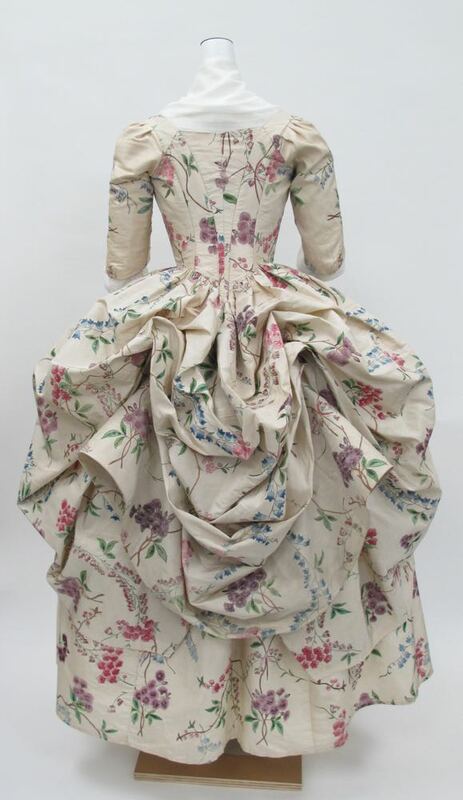 The colors and shapes of the flowers strike me as the epitome of this period, and even though I find the concept of a bustle impractical in the extreme, the draping of it is almost like a beautiful sculpture. The only niggle is the odd placement of the two almost rectangular floral motifs just above the waistline at the back. There isn’t one thing I don’t like. I love the flowers and the pickups and the shape. If I could get this fabric now, I’d love it in a nice summery dress. I can’t stop looking at it, 10/10! 10/10 i love this dress sooooo very much. I would wear it in a hot minute. It’s nice to see a dress without all the embellishments so that the textile really stands out. Any number of accessories could be added, but I think the strength of this dress resides in its simplicity. It’s a breath of fresh air. Is there an 11 over ten? If not, I will give it a 10 for Fabric, use of fabric, style of dress. So beautiful. Really captures the delicacy of the style and the colors are superb. I would love to wear it. So many things I love. Beautifully coloured flowing painterly designs over a solid ground. Light, airy textiles with minimal fuss and floof. Draped goodness. I love the essential simplicity and tastefulness of this dress and for once the absence of accessories isn’t a problem here because this dress is all about itself and even with a fichu and engageantes and shoes and a bergere hat and a hairdo and a parasol, it would still be a beautiful dress shining on its own merits. How can you not love this? 9/10 for mis-matched seams. How charming can a dress be? Right here, folks! My only quibble is that I wish the floral pattern was placed a little differently on the front panels of the bodice, so that we didn’t get an asymmetrical repeat. This is a gorgeous teacup of a dress. I don’t find it particularly exciting, but it’s lovely. The fact that it’s so delicately hand-painted sent me down a mental rabbit hole about the intersection of clothing and paper. Yesterday I saw a blog post about an exhibition of historical dresses and costumes, scrupulously recreated as paper sculptures. Definitely way more complex than the paper dress fad in the 60s. People put writing on their shirts all the time, sometimes to make a statement/joke, but also just as an element of design, not even meant to be read or understood. And then I thought about how so many modern clothes start life as paper patterns. Cyranetta pointed out that this dress is sculptural, and to me it almost looks like origami. Wearing a dress of hand-painted fabric blurs the line even more. She’s technically wearing a painting. Maybe with the greater availability of paper goods like wallpaper, artistic prints, and books, it makes sense for dresses to take a shift in that direction? And having paper to make patterns from might have allowed seamstresses to be more experimental. It was an interesting rabbit hole to be in; I enjoyed my time there! But back to the dress. It’s artificial and buoyant, but it avoids looking comical. The flowers also help it look more organic and natural, despite the stylized lines of the dress. But it doesn’t scream “I’m wearing an illustrated botany manual” either. I’m not sure if I prefer its simplicity and straightforwardness to something more unusual, or if I feel it’s a little insipid. The asymmetry doesn’t really bother me. Whether it’s forgettable or insipid or anything like that, it’s still straight-up lovely. I love this dress. So feminine, so classical, modest in its hoops, charmingly painted. I wish it were mine! Everybody has already said everything about this glorious dress. There isn’t a single thing I don’t like about it. The painted silk is luscious beyond description! For me this dress has a wonderful delicate freshness. It is so simple but so charming and the hand painted pattern on the fabric is exquisitely pretty. And yet I feel that there are some areas that could use just a small amount of embellishment, perhaps around the neckline or the sleeves. They somehow feel unfinished, as if they were expecting something else. It would be a careful and delicate detail and wouldn’t detract from overall uncontrived unity. I am charmed but not completely wowed. For that I think an 8/10. Very, very pleasing! The fabric is beautiful and the form of the dress is exquisite. I do wish the two mauve bits on the front of the bodice were symmetrical, but that is my only quibble. Wow …. For it not being painted after sewing, or not painted specifically for the dress, they did an excellent job balancing the major motifs on the front bodice and sleeves. I love the fabric. It has a good blend of colors and distribution of motifs, but isn’t overwhelming the shape of the dress. I can easily imagine it with blue satin heels, lace sleeve ruffles and a heavily ruffled neck filler. And a cute little headpiece with silk or real flowers. I love this dress! The color scheme looked a bit wallpaper-y at first glance, but I adjusted the tilt of my laptop screen and saw the real colors. 🙂 There is nothing I dislike about the colors, the fabric, the cut, or the overall style–it’s refreshing to see something not so elaborately trimmed once in a while! The ONE AND ONLY THING I am not 100% in love with is that the flowers appear far too big for the way the bodice is cut. Mismatched printing in seams is acceptable, but the large size and erratic placement (because of the seams) of the bodice flowers looks awkward. However, the floral’s size is perfect everywhere else on the dress, so I can’t really complain…or even take half a point off! The painted flowers are so joyous, and I’m glad it has no trim because it doesn’t need any. I can picture it with some dark purple accessories. Purple mitts and a hat with purple ribbons would look quite lovely with it, but it’s stunning on its own too. The flower placement in the front would be better if it was completely symmetrical of completely asymmetrical, but the fact that they aren’t doesn’t bother me. This is lovely and although I don’t like bustles it’s such an elegant dress. The material did however remind me of Laura Ashley curtain material! The longer I look at this dress the more I like it! At first glance, it’s a bit simple but the simplicity allows the beautiful fabric to be the star of the show. The fabric and construction of this dress is absolutely exquisite! I have a personal problem with pick-ups though; I don’t know why but they just really grind my gears. I absolutely love everything about it, the color palette is so modern and lovely and delicate if compared to other things from that time, the simple cut and the lack of frills enhances the clean line and the exquisite construction. But that asymmetrical front is driving me nuts. Such a sweet dress, it reminds me of the Dresden China figurines that everyone owned when I was young. Nothing to dislike! Absolutely lovely, a perfect representation of my imagination of that kind of a dress. I can picture myself wearing it 30 years ago. It is a young woman’s dress in my eyes. The fabric is joyous and the pastel colors are sweet and adorable but I am not thrilled with the seaming, it could be better done. I absolutely love this dress! The view from behind looks like a meringue confection, light enough to float away, but sculptural at the same time. I can just see the wearer with a huge powered wig puffed and curled, adorned with flowers to echo the ones in the dress. I would love to wear it. Normally the pattern mismatch on the front bodice would make me twitch but it doesn’t with this dress, maybe because the pattern is large enough to seem random even though it almost matches. I find this dress pretty but insipid and the fabric looks a little home dec to me. I love it! 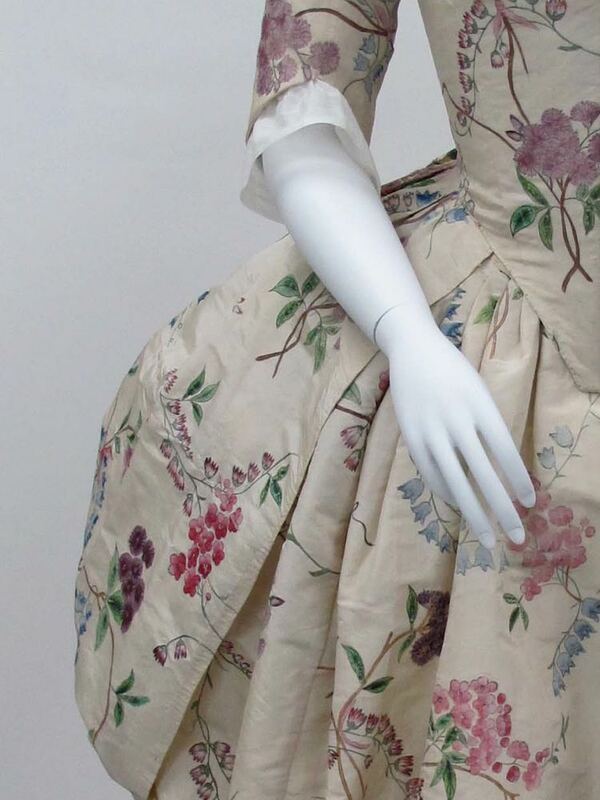 The choice of colors by the artist who painted this fabric is marvelously delicate and the proportions of the floral design turn out to be beautiful despite the pattern mismatch in the center front. It would shine with appropriate accessories, but even alone it’s a perfect 10. I quite like this dress. I’m a fan of Anglaise’s in general, and the fabric is very pretty. You don’t see too many painted silk dresses, and this is a very nice example. Only downside would be that it’s relatively plain, but then again, that does allow the fabric to shine. Beautiful. I love this dress. I am especially impressed with the hand painting. It completely changes what could have been a boring dress. The delicate quality of the flowers and fruit give the dress personality. The manner in which the back is draped is pleasingly architectural. When all parts are considered it is art. 10! Next PostRamsay to Renoir: I’m coming down to Nelson for a fashion history talk!